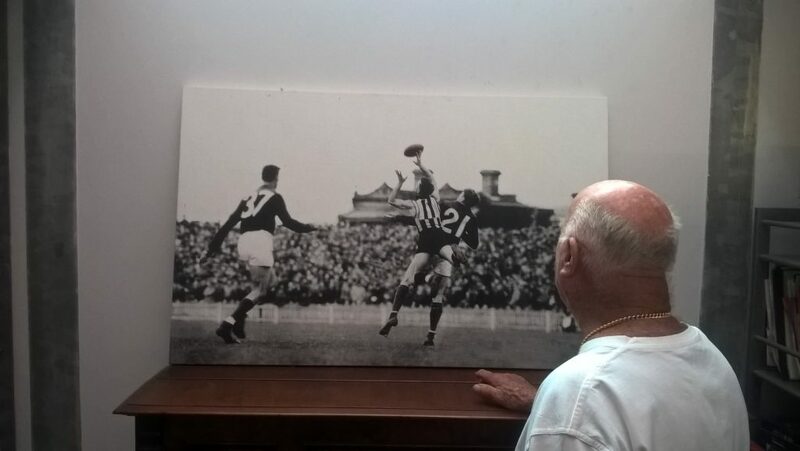 Raymond Jones, now 91, in front of a photo of him marking over Don Cordner from the front page of a 1947 edition of The Sporting Globe in his Perth home. 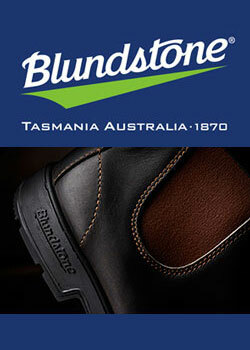 Geelong born Raymond Alfredo Daniel Jones was a name unknown to me until the first week of this year. 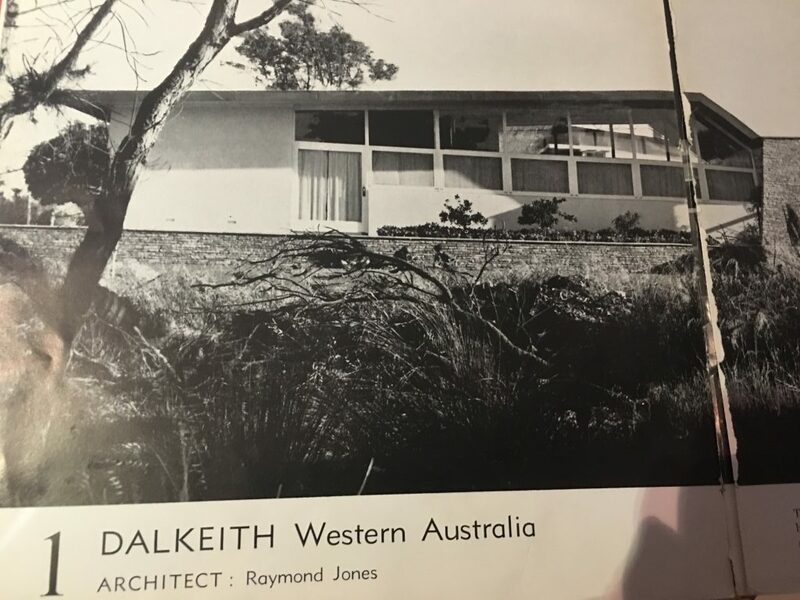 The day before leaving on holidays in Western Australia I was collecting mail from the soon to be vacated office of my recently retired architect father when I was drawn to a familiar book on a shelf. Best Australian Houses features 20 modernist style homes. Number one – the Kiernan House in Dalkeith by R. Jones is 60 this year so interested me enough to bring Dad’s well-worn edition along in my luggage. The same day of my arrival I found Raymond Jones in the local white pages and instantly detected joy in the 91 year old’s voice as soon as my association with the book he hadn’t seen in decades was established. More intriguing from our phone call was about him playing for Collingwood under the legendary Jock McHale straight after three perilous years in the Pacific war. 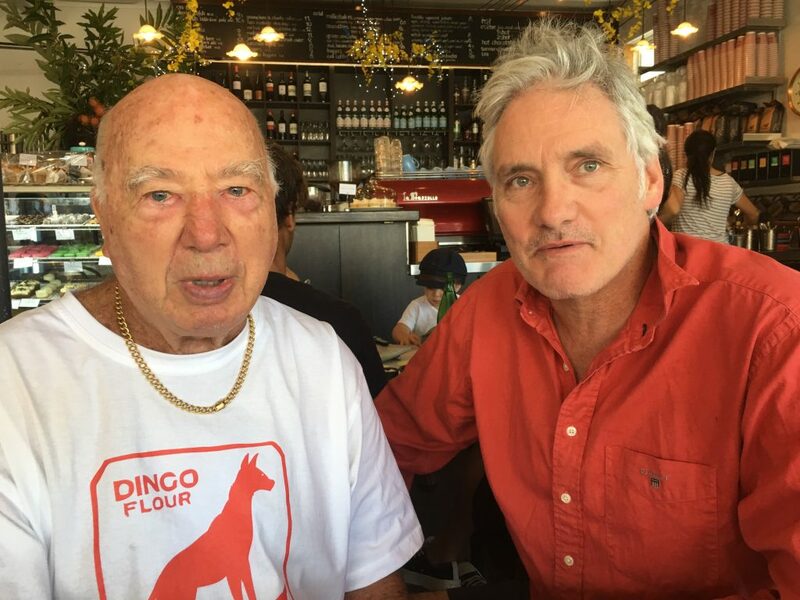 Our meeting the following day at Gino’s in Fremantle was triumphant. 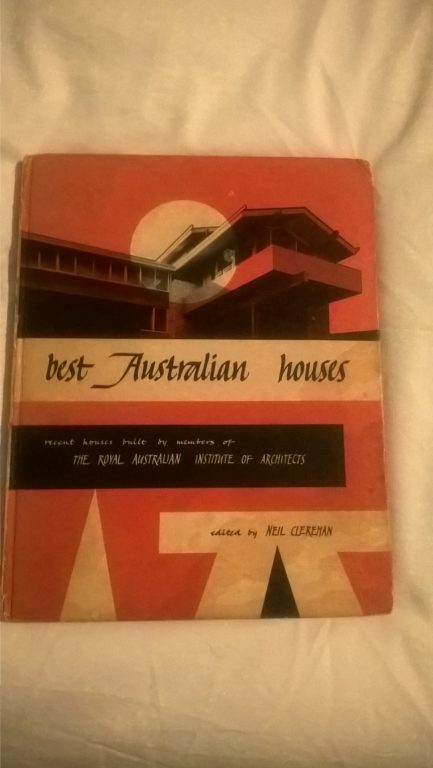 His hearing is poor and eyesight fading but memories of Melbourne pre-1953 had been triggered, including my Dad either on stage in wickedly funny revue skits or hanging out with Ray’s studio master, the inspirational Robin Boyd. Ray assured me the two great mentors in his life, McHale and Boyd, gave him the necessary foundation for a career spanning almost 2000 commissions in 60 years. His Olympic level boxer dad Raymond Snr’s involvement in the Eastern Beach development at Corio Bay in 1928 had sparked young Raymond’s interest in design. A move to South Yarra in 1935 he says continued an idyllic youth with the huge Fawkner Park within a drop kick from home. 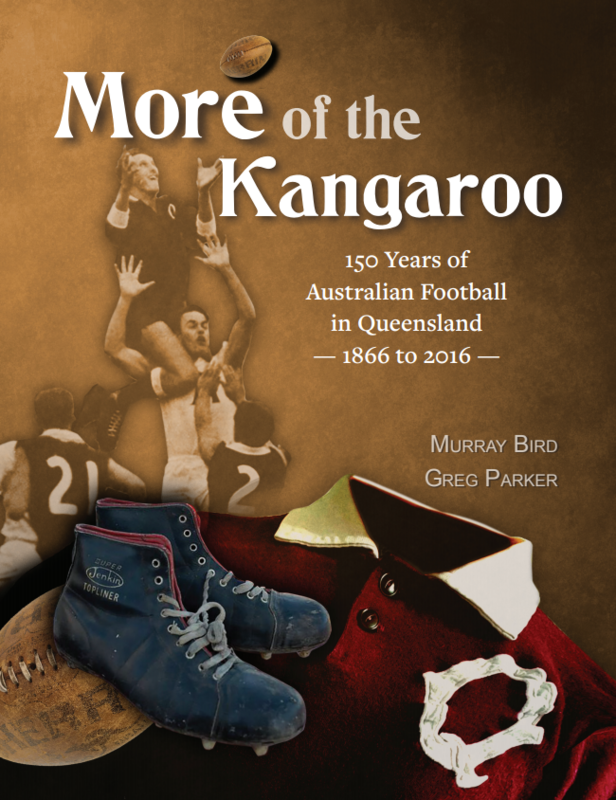 A post-season friendly in 1946 opened the eyes of the 21 year old to the west but not until South Fremantle enticed him in 1953 where he returned to play in a premiership that very year. 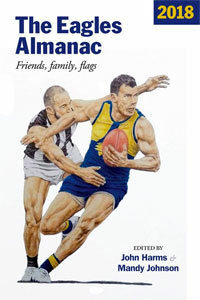 Raymond believes his first year at the Pies as his best chance at a flag but he blames a torn hamstring to superstar Bill Twomey early in the drawn semi final which dashed any hopes of playing in a Grand Final. Yesterday, we joined Raymond and Sonja for breakfast where staff treated us all like royalty. To top off a delightful morning with Raymond and Sonja they invited us to their home where Ray presented a painting for my ailing father Neil and a Dingo Flour T-shirt for myself. What a wonderful privilege to connect with a maverick whose passion for design extends far beyond to the environment, social justice and politics and equals his love of staying active in the Indian Ocean and more recently with a paint brush. Raymond was touched that Eddie acknowledged his 90th birthday and is very keen to entice his fellow St.Kilda CBC old boy to this coming ANZAC Day game so I hope to see my new friend Mr Jones again around then. 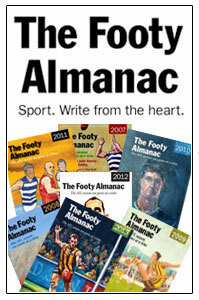 Photos to come – a huge photograph adorns top of Raymond’s piano is from Sporting Globe front page in 1947. Hapless bloke underneath is 1946 Brownlow recipient Don Cordner. Absolutely brilliant Dave. Such a spiritus mundi meeting. I would love to meet Raymond myself. Perhaps we could organise a Perth lunch and invite Raymond and Sonja. Interesting to hear more of your father too. When Susan and I first came to Melbourne we rented an old terrace owned, I am told, by the Romberg family. Great read Dave and hats off to you for making the effort to seek out Raymond on your holidays and sharing a little of his story. Terrific stuff – Ray and Dave. Such a life, still being lived well. Well played those men. Loved the read Dave. Enjoyable, what an interesting man. Well done you to seek him out.